Diabetes is one of the 6th most deadly diseases in the world, there are about 371 million diabetics worldwide and 19-20 million of whom are Indonesians. The 7 countries with the highest diabetics in the world are China, India, USA, Brazil, Russia, Mexico and Indonesia. 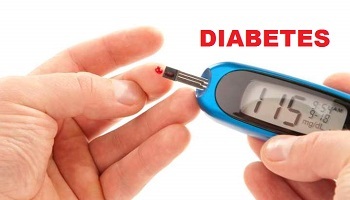 Diabetes is a disease in which the body is unable to produce the hormone insulin (blood sugar-regulating hormone produced in the pancreas gland) or insufficient insulin hormone that is not sufficient and can not function properly. This causes the buildup of sugar (natural glucose) in the blood to rise, in the absence of insulin glucose can not be changed and stored into glycogen and eventually glucose spread throughout the body through the blood vessels. A condition where the body is completely unable to produce the hormone insulin. So the patient must use insulin injections to regulate blood sugar. Most of the sufferers are children & adolescents. Occurs because the body does not produce sufficient hormone insulin or because insulin can not be used properly (insulin resistance). This type is the most current (90% more), often occurs in those over 40 years old, obese and have a history of diabetes in the family. The above symptoms are common, but in some people there are often no symptoms at all. To be sure, blood checks are required in the laboratory. Fast food or junk food is very dangerous for your health, not just for diabetics, but also for everyone. Therefore one of the best ways to deal with diabetes is by avoiding the consumption of junk food. read also articles about the dangers of junk food here. Carbohydrates are very important for the body, because carbohydrates are the main source of energy in the body. The body will break down carbohydrates into simple sugars (glucose) and then insulin works by transferring the sugar from the blood into the cells to be energized and stored for energy reserves (glycogen). Therefore you should pay attention to the intake of carbohydrates that enter the body. Choose foods with a low glycemic index, a glycemic index is an index number that indicates a type of carbohydrate that potentially increases blood sugar levels quickly. Consumption of foods with low glycemic index proven to reduce blood sugar levels in the long term in people with type 1 and type 2 diabetes. Fiber can help slow the digestion and absorption of sugar into the body, so as to reduce the spike in blood sugar and improve overall blood sugar control. In addition, high-fiber foods can help treat type 1 diabetes by improving blood sugar control and reducing blood sugar levels. Deficiency of micronutrients (chromium and magnesium) can cause high blood sugar in the body. Chromium is involved in the metabolism of carbohydrates and fats, as well as helps control blood sugar levels. Chromium deficiency can cause you to experience carbohydrate intolerance and magnesium deficiency may increase your risk of diabetes. Consumption of lots of water is one natural and appropriate way to lower blood sugar, because with the body has enough fluid reserves can help keep blood sugar levels in the blood. In addition to drinking enough water can also help the kidneys work to dissolve and remove excess blood sugar through the urine. Maintaining weight is an important thing to do for people with diabetes. By maintaining weight means also maintain the pattern and the portion of food, and should regulate the intake of calories that enter the body, this can significantly lower blood sugar levels. Stress can affect blood sugar levels, therefore control your stress level if you want to successfully lower blood sugar. At times of stress, the body will produce more glucagon and cortisol hormones, which can cause a rise in blood sugar levels. Exercising is one natural way to lower blood sugar, exercise is very well done to deal with diabetes. Not just for sick people, exercise is a positive activity that can improve and maintain your physical and mental health condition. From now on you should be diligent exercising regularly, start from a mild sport just like jogging and cycling, do not directly do heavy exercise. Adequate and quality sleep is necessary to maintain good health, irregular sleep habits or frequent stay up may affect blood sugar levels and insulin sensitivity. Perform the above steps with a consistent order of diabetes or blood sugar that you suffer can gradually improve. Most diabetics are caused by poor lifestyle, such as poor diet, often staying up late, and lack of exercise. From now on fix the pattern of your life for health to stay awake and avoid various diseases.